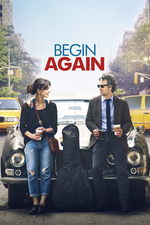 The latest film from writer-director John Carney (ONCE), BEGIN AGAIN is a soul-stirring comedy about what happens when lost souls meet and make beautiful music together. Lovelorn songwriter Gretta (Keira Knightley) meets Dan (Mark Ruffalo), a disgraced record-label exec. From this chance encounter emerges an enchanting portrait of a mutually transformative collaboration, set to the soundtrack of a summer in New York City. I saw this movie last night and was still thinking about it this morning, so thought I'd bring it up on FanFare and see if anyone else wanted to talk about it. I found it really interesting that it hits so many of the tropes of romantic comedies, but in the end, there was no romance at all, unless you count learning to love yourself as a romance. Overall I was a little meh on this one, even though there were some absolutely great moments in this. I was really into the recording of the album and most of the musical stuff, it just felt like it took a little too long to get there. I see what you're saying about how it can be a romantic comedy where the romance is about loving yourself, but I guess I was hoping/expecting it to be more about learning to love the music (again). That's what I expected to before seeing it, but after seeing it, I feel like it started from a place where they still loved the music, where loving the music was maybe all they had left, and then the music was the catalyst for everything else they managed to change. It certainly has a great cast, in addition to your recommendation. I'll check it out. It's interesting to compare Begin Again to the director's similar film Once. Once is about songwriting, singing and playing; Begin Again is about making records, producing a complete sound that the singer-songwriter is only the kernel of. I'm more sympathetic to the viewpoint in the new movie, since I'd rather listen to ELO than Nick Drake, but I don't think it's going to launch any superstar careers like the old one did for Glen Hansard and Marketa Irglova. But both capture well that intimate emotional connection between people who collaborate musically, which is so easily mistaken for love but really is not. How did y'all interpret the ending? It seemed that Gretta decided she didn't want to be part of the Music Industry. She set her album free, she gave back Dan's headphone splitter, she refused to take credit for her song at Dave's show, she turned her back on the record label's contract. It was a fun summer she'll never forget but now she's riding, grinning, free. Not everyone who plays music has to become a musician. Also: Bespectacled music geek Dave Kohl -- Phonogram reference, or what?? Well, I noted earlier that I think the movie is mainly about learning to love yourself, so I think I'd use the word 'independence' more than freedom to describe the ending. She doesn't need Dave, and she doesn't need a record level, and she needs Dan only as a partner and a collaborator, not as a lover. I didn't get the impression that she wouldn't become a musician, that she had made one album and that's all she'd ever feel the need to do -- more that if she was going to continue to make music, she'd do it outside the system, independently. I saw this years ago but it was before I was a regular on MeFi, with A Star Is Born coming out I was reminded of this movie. I really enjoyed it when I saw it, and the two main songs are in my playlists. I had no idea Kiera could sing that well! I thought her not getting with Dan was a big deal and really made the movie great. It really is about just the music and finding your independence.